Here's everything you need to know about IMTS 2014, including an interview with Peter Eelman, AMT's VP of Exhibitions and Communications. Here are the booths that should be of interest to gear manufacturers attending IMTS 2014. Special advertising section featuring IMTS 2014 booths you won't want to miss! The honing of gears - by definition - facilitates ease of operation, low noise and smoother performance in a transmission. Honing also contributes to reduced friction in the powertrain. Both the intense cutting (roughing process) as well as the functionally fine- finishing of transmission gears can be performed in one setup, on one machine. This presentation introduces a new procedure that - derived from exact calculations - aids in determining the parameters of the validation testing of spiral bevel and hypoid gears in single-reduction axles. IMTS is about beginnings. This year's show takes place September 8-13 at McCormick Place in Chicago. With more than 1,900 exhibitors expected to occupy more than 1.2 million square feet of exhibit space, there will be plenty of technology on display. See the latest online video from Gleason, plus explore the THORS Academy Gears Knowledge Center and our Back to Basics archive. The complete Product News section from the August 2014 issue of Gear Technology. Why is there so much emphasis on the tooth contact pattern for bevel gears in the assembled condition and not so for cylindrical gears, etc? The complete technical calendar from the August 2014 issue of Gear Technology. 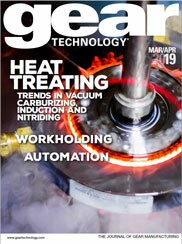 The complete Industry News section from the August 2014 issue of Gear Technology. Sally Ride Science will be featured at IMTS 2014.